When Damon Albarn announced earlier this year that he was bringing the Gorillaz back by debuting four different singles over four different media outlets, the biggest surprise was how many people still actually cared. With their peak on 2005’s Demon Days being at a point when the idea of a band represented entirely by virtual avatars was a novel concept, the teaming up of Albarn on instruments and Jamie Hewlett on the visual side seemed to dissipate from there, with 2010’s Plastic Beach engulfed in significantly less buzz and 2011’s The Fall being a mere whisper in the breeze. So apparently this new, updated version of the Gorillaz is a big event, judging by the magnitude of the lead-up to this fifth album Humanz. And honestly, this is it? A loosely strung-together collection of electronica and hip-hop that, even when overloaded with guest stars, fails to muster up anything beyond a handful of moments that are even remotely remarkable? For an album like Humanz whose one chance of success rests of the shoulders of its guest performers, Albarn gives them precious little to work with. It makes the highlights that much easier to pick out – Peven Everett brings some soulful energy to the elastic synthfunk of Strobelite, the blubbery electro / dancehall Popcaan collaboration Saturnz Barz may threaten to fully collapse on itself but actually turns out fairly compelling, and Vince Staples and Pusha T practically steal the show with their effortless flows on Ascension and Let Me Out respectively. Looking at the rest of the roster though, they can be distributed into one of two camps – either completely under- or misused, or backed by a composition that does them no justice. The former is occupied by Grace Jones and D.R.A.M, with Jones being entirely wasted on Charger in her role of providing ad-libs behind Albarn that could’ve easily been left out, and D.R.A.M’s presence on Andromeda being almost nonexistent, given how he’s reduced to a wafer-thin, willowy falsetto that’s pushed right back in the mix. As for the latter, De La Soul just ooze charisma on Momentz but aren’t helped by the track’s thudding, blocky beat, and closer We Got The Power recruits Savages powerhouse Jehnny Beth and, almost unbelievably, Noel Gallagher, but pairs them again a chiming, swollen instrumental that sounds more than a bit mawkish, and relegates Gallagher to a backing vocal role that’s frequently unidentifiable amongst the clamour. But while on the topic of instrumentation, it’s worth noting the massive elephant in the room, in that Humanz essentially makes Gorillaz existence as a band redundant. This could be a Damon Albarn solo project without a lick of difference, and ultimately it feels all the weaker for that. Gone are any tight basslines or real drums that were present in any previous incarnations of the Gorillaz, replaced by tentative, popping beats that frequently sound recycled between songs, with Albarn’s vocals constantly buried in filters to make his already listless voice sound even more so. The worst is on Busted And Blue, the sole track that features no guest artists, where Albarn sleepily mumbles his way over a formless bed of watery synths and clicks that doesn’t even try to hook the listener in. It’s because of this that Humanz‘ admittedly ambitious set of lyrics becomes lost in the shuffle, which is a shame given that this is probably the area that works the most for what it is. This time, Albarn’s vision is a more sociopolitical one, spurred on by Donald Trump’s presidency and concerning the next steps of human society in such a climate. Credit to him, then, that the rappers he’s recruited can convincingly pull this off. Danny Brown’s verse on Submission sees him delving into his own mental health in a society that just sits idly by, Ascension sees Vince Staples chastising the same society on an intrinsic view of different races and sexualities as the lesser, and Pusha T’s cries for help in the US’s current political environment colour on Let Me Out, probably the best song on the album. In fact, pretty much all of Humanz‘ hip-hop tracks automatically float to the top of the pile, as they can convey their subject matter in the most convincing way. Moving away from them though, Humanz has absolutely no synergy between its content and music, severely lacking the sort of gusto and populist mindset to have the same effect. Just take Hallelujah Money, where Benjamin Clementine warbles about financial influences tainting the US election, but with its canvas of a backing choir and shuffling, energy-bereft beat, any sort of political forcefulness is completely drained, an unfortunate reality of most of this album. And this really is basic stuff that should’ve been done better; Albarn and Hewlett clearly know what they’re doing with the Gorillaz – the whole project was designed to satirise micro-managed, manufactured pop music, after all – so why this album feels so weak and shoddy when it can’t afford to is a complete mystery. Really, the sum of Humanz‘ parts should make it a far better album than what it is; there’s clearly a budget and an enormous sphere of influence given the number and status of collaborators involved here. But too often it feels like an album that’s mismanaged through cutting corners and trying to be more obtuse than it can convincingly muster. Even then, the general lack of presence from Albarn, both vocally and instrumentally, bogs it down even further and removes any probability of even a fluke save. 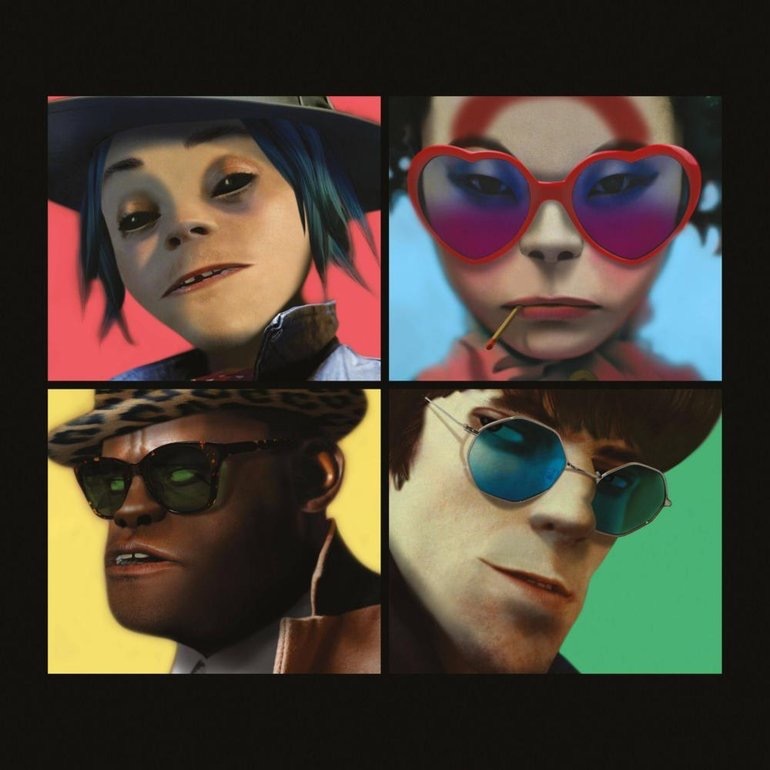 Given the popularity of the Gorillaz this will do well regardless, but if a sloppy, slow bore of an album like this is what materialises after six years away, name recognition can’t be enough to give it a pass. The most impressive thing about it is that Albarn actually convinced Noel Gallagher to appear. ‘Humanz’ by Gorillaz is out now on Parlophone Records.